No two live edge slabs are alike, which is a rewarding challenge for designers and woodworkers. 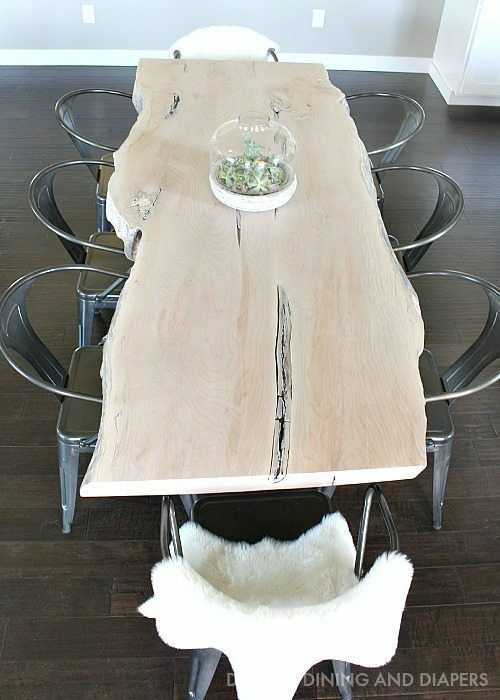 Live edge designs must account for the character and quality of the slab, especially the shape and species of the wood. RE-CO takes all of our slabs one step further by tracing the history of the tree and where it grew, giving an heirloom quality to our furniture from the roots up. With so many custom live edge designs online, RE-CO is always coming across pieces that excite us and inspire us in the shop, while there is no way to clone an existing piece it’s a fun challenge imagining how we would approach the same project with a different slab. The following pictures are pieces that hopefully inspire you too, and suggestions for slabs we have available in our shop that would function in similar ways. Love the contrast of the dark kitchen with this Maple table finished with milk paint. After Hurricane Sandy, Green-wood Cemetery amassed a very large log pile from the cleanup, including this beautiful Norwegian Maple. Green-Wood Cemetery was founded in 1838 as a rural cemetery in Kings County, New York. It was granted National Historic Landmark status in 2006 by the U.S. Department of the Interior. Celebrity residents include Boss Tweed, Charles Ebbets and Jean-Michel Basquiat. A burl chandelier is an excellent way to bring a natural feeling to your space. This tree was removed from Prospect Park in Brooklyn, NY after sustaining damage from Hurricane Irene in 2011. The lower portion of the trunk was simply too large for the machinery to handle, and was cut into chunks for the chipper. We were able to harvest this chunk of burl from the crotch of the tree, and it was well worth the effort. The waterfall effect of this counter is a great way to use a uniquely shaped slab. NYC Parks Department contacted us about helping them clear out a stockpile of logs they had in Cunningham Park, Queens. The trees came from public areas in and around Cunningham Park, where they were either dead, suffered storm damage or needed to be removed for road work or park maintenance. If you are looking for more inspiration make sure to follow us on Pinterest!